For surfers across the globe, the love for the sport not only crosses geographical borders but cultural boundaries as well. This “universal stoke” is something San Clemente-based pro surfers, the Gudauskas brothers, have aimed to share with the next generation of surfers worldwide. Their latest venture has their efforts focused on helping the groms of Jamaica grow as athletes in the sport. Dane, Patrick and Tanner Gudauskas set out nearly five years ago to share the stoke of surfing, ocean awareness, water safety, the joy the ocean has brought to their lives as surfers and a passion for protecting the environment. They launched their annual Stoke-o-Rama surf event, a free, locals-only event for kids and a fundraiser for the city’s Junior Lifeguards program and have so far raised nearly $40,000 through the events. Soon their mission would expand to include groms all over the world. To support this larger effort, the brothers created the Positive Vibe Warriors Foundation in 2015. Since then, they have sponsored a surf team from Norway for the 2015 International Surfing Association World Championship, expanding the Stoke-o-Rama to Hawaii. Along the way they discovered an emerging surf community in Jamaica, full of stoked groms with plenty of potential but lacking in the quality equipment necessary for the kids to have the best opportunity to reach their surfing goals. And Positive Vibe Warriors Jamaica Surfboard Drive was born. 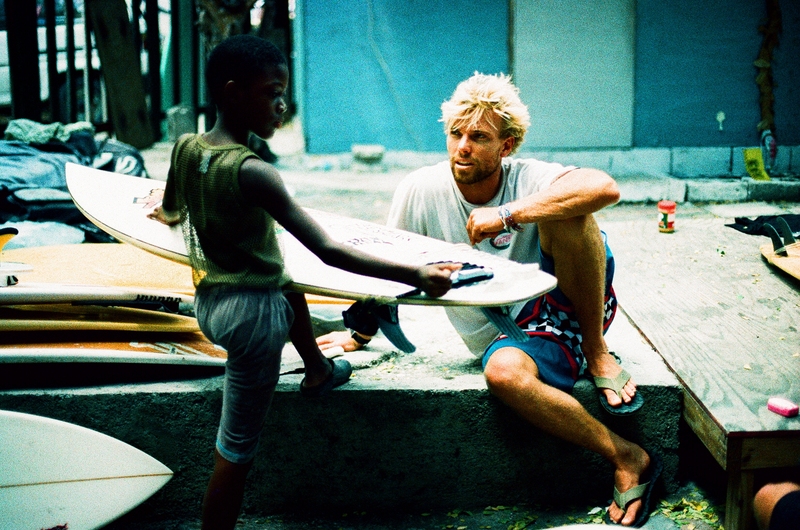 There are some great people there already doing great things and helping to feed that enthusiasm, Gudauskas added, mentioning Billy “Mystic” Wilmott as an example, having been a surfer all his life, shares his love for the sport and support for the future of Jamaican surfing. But with only a relative few rideable boards, often with multiple repairs and missing fins, the kids don’t have the equipment they need to take their skill to the next level. The PVW Jamaica Surfboard Drive will collect used surfboards of all shapes and sizes, as long as they are water tight, at Jack’s Surfboards shops through March 31. The nearest site to take donations to is in Dana Point at 34320 Pacific Coast Highway. In addition to surfboard donations, the brothers have created a special line of accessories, “Positive Vibrations,” for sale on their website and are also accepting monetary contributions to the cause. Donations are tax deductible and proceeds will benefit the Jamaican Surfing Association, to help with infrastructure and ISA goals. “One day we hope to see the talented Jamaican groms on a world stage, but more than that, we enjoy connecting youth with the ocean in a positive way,” Gudauskas said, adding that the surf community has been responding generously since the drive started at the beginning of the month. To find out more about the program, visit the “blog” section at www.positivevibewarriors.com.